Setting the right temperature and getting the right humidity for optimal germination of seeds and the ideal conditions for plants is the key to good growing conditions. By using X-Stream Heat Propagators you can combine the humidity and heat retention of your X-Stream lid with a highly accurate and thermostatically controlled heated base. 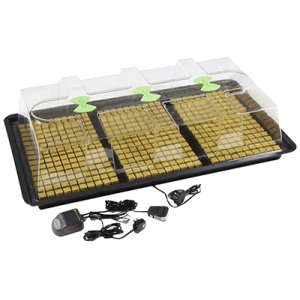 With these propagators you place your cuttings or seeds onto the heated base and can use any propagation medium. You can set the desired temperature to within 1°C by using a digital thermostat (this is included in some kits only). You put the thermostat probe inside the propagator so you can check the readings on a regular basis and make sure the desired temperature is maintained. Growing temperatures vary depending on the type of plants being cultivated so you should always check to get the optimal atmosphere. Our X-stream Propagators are manufactured to fit sunblaster combo units on the top of the transparent cover, providing the perfect spectrum and intensity for young rooting plants.